Bibbins earns first-team honors in his one and only season at the U. (Trent Nelson | The Salt Lake Tribune) Utah Utes guard Justin Bibbins (1) as the University of Utah hosts USC, NCAA basketball at the Huntsman Center in Salt Lake City, Saturday Feb. 24, 2018. Utah senior point guard Justin Bibbins made a large impression in his one and only season in the Pac-12. Bibbins was named All-Pac-12 first team on Monday in a vote by the conference’s coaches. Senior forward David Collette, a former Murray High standout, also garnered All-Pac-12 honors for the first time in his career. Arizona’s Deandre Ayton won the conference’s Player of the Year and Freshman of the Year honors, while Washington coach Mike Hopkins won Coach of the Year. Washington also brought home Defensive Player of the Year, with that award going to Matisse Thybulle. Sixth Man of the Year honors were split between Arizona State freshman Remy Martin Colorado’s senior Dominique Collier. The coaches voted Washington State forward Robert Franks the Most Improved Player, and Stanford’s Dorian Pickens garnered Scholar-athlete of the Year honors. 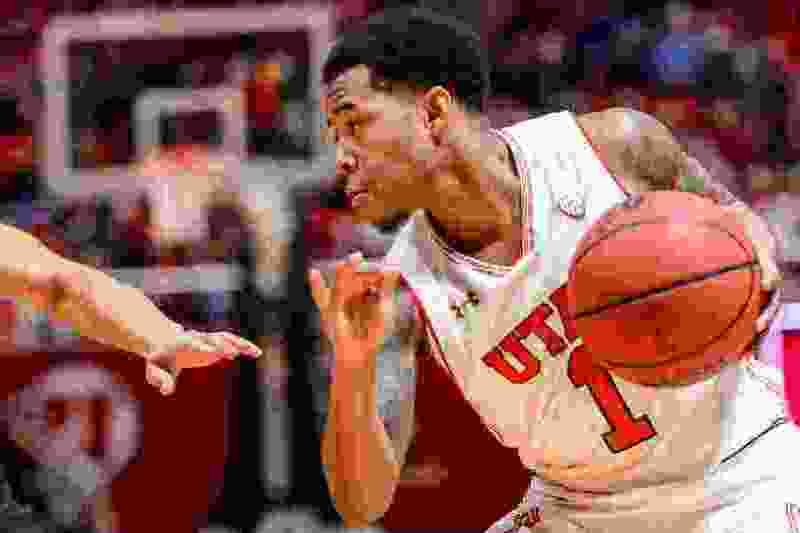 Bibbins, a native of Carson, Calif., became the fourth Utah player to earn first-team honors in the past five seasons, joining Delon Wright (2014 and 2015), Jakob Poeltl (2016) and Kyle Kuzma (2017). Collette earned second-team recognition after previously earning third-team All-Mountain West honors while at Utah State during the 2014-15 season. Bibbins, who joined the Utes this past summer as a graduate transfer from Long Beach State, averaged 14.4 points per, 4.9 assists, 2.8 3-pointers and 1.3 steals per game while shooting 45 percent from 3-point range. He led the team in each of the those categories as well as minutes played, and ranked second among Pac-12 players in 3-point shooting percentage, 3-pointers per game and assist-turnover ratio (2.7-1). A two-time All-Big West selection in his three seasons at Long Beach State, Bibbins did not struggle at all in stepping up to face the competition of a Power 5 conference. On the contrary, the 5-foot-8 Bibbins’ raised his production during conference games and averaged more points (15.8), assists (5.1) and 3-pointers per game against Pac-12 teams than he did overall this season. He also recorded all three of his double-doubles during conference games against Washington (20 points, 10 rebounds), Washington State (13 points, 12 assists) and UCLA (17 points, 10 assists). Collette shot 65.3 percent from the field during conference play to lead the Pac-12, and he also averaged 12.4 points and 4.7 rebounds per game in 18 conference games. Honorable Mention: Rawle Alkins, guard, Arizona; Shannon Evans II, guard, Arizona State; Robert Franks, forward, Washington State; Jaylen Nowell, guard, Washington; Dorian Pickes, guard, Stanford; McKinley Wright IV, guard, Colorado. Honorable mention: Troy Brown, forward, Oregon. Honorable mention: Chimezie Metu, forward, USC; McKinley Wright IV, guard, Colorado.